Acknowledged author Donald Voet wrote Fundamentals of Biochemistry comprising 1184 pages back in 2016. Textbook and etextbook are published under ISBN 1118918401 and 9781118918401. 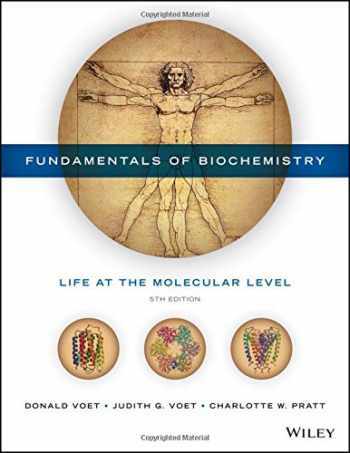 Since then Fundamentals of Biochemistry textbook received total rating of 4 stars and was available to sell back to BooksRun online for the top buyback price of $85.89 or rent at the marketplace. NOTE: Access Code NOT INCLUDED Voet, Voet and Pratt’s Fundamentals of Biochemistry, 5th Edition addresses the enormous advances in biochemistry, particularly in the areas of structural biology and Bioinformatics, by providing a solid biochemical foundation that is rooted in chemistry to prepare students for the scientific challenges of the future. While continuing in its tradition of presenting complete and balanced coverage that is clearly written and relevant to human health and disease, Fundamentals of Biochemistry, 5e includes new pedagogy and enhanced visuals that provide a pathway for student learning.